GamParse 1.5.0 is available in two forms, the installer package, which is the preferred method, and a standalone executable. The installer allows for easy update checking to ensure you are using the latest version of the program, and that your computer meets the minimum requirements to run the program. The installer package requires "Windows Installer 4.5" to be on the computer and can be downloaded by the GamParse installer for you. It may also be downloaded manually via Windows Update or directly from Microsoft here: https://www.microsoft.com/en-us/download/details.aspx?id=8483. The standalone executable does not require Windows Installer 4.5. Both forms of GamParse 1.5.0 require "Microsoft .NET Framework v4.0" to be installed on the computer. The 4.0 Framework does not come pre-installed on any version of windows, but can be downloaded by the GamParse installer for you. Those using the standalone executable may download the 4.0 Framework via Windows Update, or directly from Microsoft here: https://www.microsoft.com/en-us/download/details.aspx?id=17718. Both versions are available on the Downloads page along with additional instructions. Note: The GamParse installer will install for the logged in user ONLY. It must be installed separately for each Windows User account. This is a Windows thing, I have no control over it. If you are parsing a group or raid most filters must be set to "Show," however doing so may generate a large amount of spam text in your chat windows that you do not want to see. To prevent this it is advisable to redirect certain filters into a minimised chat window so that you do not see them in game. To do this, create a new chat window, right click on the new window, select filter, and then choose the information you wish to hide. Once all filters you wish to hide are moved to the new chat window, minimize the chat window and place it somewhere out of the way. Note: It is not advisable to expand this chat window again. Once information has built up in the window, expanding the window will force EQ to attempt to display all the information in it, locking up your computer for several minutes and possibly resulting in a crash. Load entire log file: This will read the entire file, parsing all information in the file. Depending on the size, this could open days, weeks, or even months worth of information, so it may take a while if you have a very large log file. Once it has completed, GamParse will then periodically check the file for any new information so if logging is enabled any new fights will appear as soon as they finish. Load last 7 days (2 days, 24 hours) from a log file: These options allow you to open your most recent log file, but skip most of the older information in the file. The 7 day, 2 day, and 24 hour options are based on the current computer time so if the log file is older than the option selected it will not have any information to display. These options are recommended if your current log file is very large and you only wish to see the last few days of information. Once GamParse has loaded the days requested, it will then check the file for any new information. Load last 6 hours/hour from a log file: These options allow you to open just a few hours of your most recent log file similar to the above options for days. The six hour option should allow you to load an entire "raid night" at the end, while the single hour option should allow you to load just the last few events. Once GamParse has loaded the hours requested, it will then check the file for any new information. Monitor a log file for new fights only: Use this when you only want to see live information. It will not load in any older information from the log file but only look for new fights that happen after you started monitoring the file. Note that all options will clear whatever information is currently displayed and load only what you had requested, "resetting" the parser. As most players only track a single "main" character at any one time, it is recommended that you set a file to be automatically monitored when you start up GamParse. This is the equivalent of selecting "Monitor a log file for new fights" each time the program is loaded. This option can be enabled from the Settings > General menu. Enabling this option will lead you through selecting a log file, but this can be changed later using the 'Select File' button. One of the main features of GamParse is the ability to share the information with others in EverQuest, on the forums, and in files you can host on the internet. 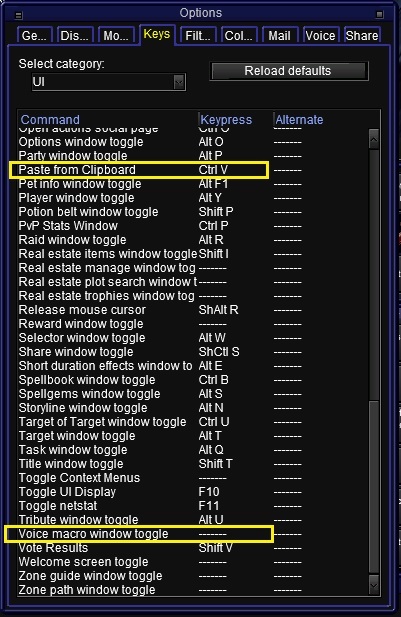 To share information in EverQuest you will first need to set up a hot key in game to paste from the computer's clipboard. To do this, open the Options window in game (Ctrl-O), go to the "Keys" tab, and select 'UI' from the dropdown menu. This will display a series of actions with key combinations next to them. Click on the key combination next to 'Paste from Clipboard' and then use the key combination you want for pasting the information into EverQuest. Control+V is the standard Microsoft Windows shortcut to paste information, however EQ assigns this by default to "Voice Macro Window Toggle", which opens the voice tell menu (EQ has sound?). I recommend clearing the shortcut to the voice tell window by pressing "Esc" and then assigning "Ctrl-O" to "Paste from Clipboard." Now that you can paste in EverQuest, you can share information. Many tabs in GamParse will have an option to 'Send to EQ', which will produce a summary of the data on the page and place it on the clipboard so you can paste it to EverQuest. Click into a chat bar to get a cursor, and then use your paste hot key to put the information into the game. Most outputs will be sent to the selected output channel which defaults to guild chat using '/GU' but you can change it to any channel you want. Some sections are specific to a player, so they will form a '/tell' to that player by default, but you can always edit the line before hitting enter if you want to share it with others. 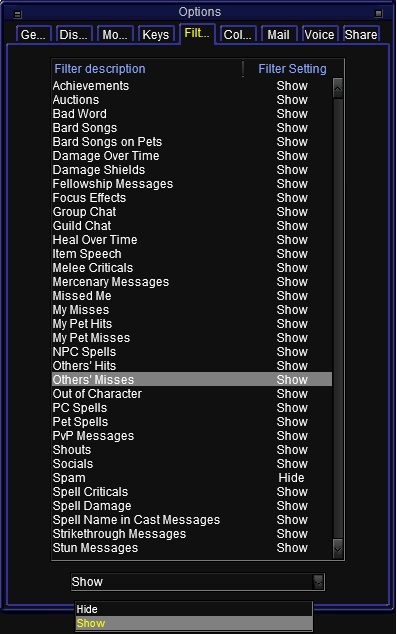 Note that if you attempt to paste more information into EQ than the chat window allows (510 characters), GamParse will automatically truncate the text and add an ellipses "..." on the end to notify you that the end was cut off. A full set of instructions are available on the Instructions Page as well as in files included in the download packages. Happy Parsing!